Answers to some frequently asked questions about investing with Brightspark. Can't find what you're looking for? Contact us and we'll be happy to help. How can individuals invest with Brightspark? Simply use your free investor account to access our investment opportunities online. Every time we invest in a new early-stage company, you will have the opportunity to invest alongside us and our network of investors. You can review details of the investment on our online platform, click “I’m ready to invest”, enter the amount and transfer the funds online. You can choose to invest on a “deal-by-deal” basis, or invest through the Brightspark Reserve - a lump amount that is automatically applied in future investments. Who can participate in Brightspark investments? At this time, only those that qualify under the Canadian accredited investor exemption (see below) can invest with Brightspark. This restriction applies to both “deal-by-deal” and Brightspark Reserve investments. In Canada, individuals that want to invest in private companies under the accredited investor prospectus exemption must meet one of the accredited investor definitions. An individual who currently is, or once was, a registered advisor or dealer, other than a limited market dealer. Yes. The company you invest through must also fit under the accredited investor exemption. The minimum investment is $10k per company. The average individual investment size is $35k-$50k. When deciding how much to invest in a deal, take into consideration that we suggest diversifying your risk by investment in multiple deals. Every time Brightspark invests in a new portfolio company, we create a single purpose Limited Partnership fund. Accredited investors in our network can invest in the fund, which in turn invests in a target company. Fund: The fund invests capital in a company. In return, it and receives and owns securities (usually preferred shares) of the company. Every fund has a unique name corresponding to the name of the target company. Company: The company in which the Brightspark fund will invest the capital. Limited Partners: The individual investors in the fund. Brightspark’s Managing Partners also invest in the fund, and are Limited Partners of the fund. Units in the Fund: Every dollar you invest gives you one unit of the fund, and your number of units determines the percentage of your ownership of the fund. Securities: In exchange for capital, companies provide securities to the Fund. In our case, securities usually take the form of preferred shares in the company. Fees: A small portion of a Limited Partner's’ investment is applied to fees. A management fee (1.5 to 2% per year for the first 3 years) goes to Brightspark and is used as a compensation for board seating, due diligence, legal paperwork. An admin reserve fee (one-time 2.5 to 4%) covers external out-of-pocket fund expenses such as legal fees, tax and accounting costs. What shareholder rights do I get when I invest? Usually, Brightspark negotiates rights such as tag along, drag along, and anti-dilution for every investment. Most of our investments are in preferred shares with standard VC terms. We also negotiates for pre-emptive rights – which means that as an investor, you get to invest more if you choose very successful companies in subsequent rounds. Does 100% of my investment go to the company? Are there any fees? Management fees (1.5 to 2% per year for the first 3 years): Goes to Brightspark and is used as a compensation for Board seating, due diligence, legal paperwork, etc. Admin Reserve (one-time 2.5 to 4%): Reserved for external out-of-pocket fund expenses (legal fees, tax and accounting costs). Note: If a company is sold, 100% of your contributed capital will be returned to you, including any fees you paid. How does Brightspark make money? Brightspark receives a small fee from investors to cover some of its overhead (see above), as well as a 15% carry from profit. This means that Brightspark only really makes money if investors make money. Brightspark is not paid for “financing a deal” like many other financial dealmakers – Brightspark is completely aligned with its investors to focus on profit from deal exits. How often does Brightspark invest in new companies? We currently invest 5-7 times per year. All companies are vetted thoroughly through the Brightspark due diligence process. Unlike traditional VC funds, we are under no pressure to deploy capital, and we commit to only invest in what we think are the best early-stage companies in Canada. This means that the investment cadence may vary, depending on the quality of the deal flow we are seeing. How long do exits take? A liquidation event (such as an acquisition or IPO) can take anywhere from a few months to several years – the industry average is 7 years. Just like a fine wine, you should expect your investment to slowly age over time before achieving its full potential. What happens if one of my investments has a successful exit? When there is a liquidation event (the company is sold or becomes public), the fund receives the proceeds of the exit, which is calculated based on its ownership in the company at that time. Brightspark returns 100% of the limited partners’ initial contribution first, and distribute 85% of the remaining profits to them (considering pro-rata). The remaining 15% of profits goes to Brightspark as carried interest. Disclaimer: Exits can take a long time, usually 5-7 years. Investing in early-stage companies is very risky, and returns are not guaranteed - learn more. Venture capital is considered a high-risk investment and a return is not guaranteed. You will only get money if there is an liquidation event. Loss of an your entire investment is possible, and can easily occur. Moreover, the timing of any return on investment is highly uncertain. Therefore, you shouldn’t invest any money that you cannot afford to lose. A good way to manage this risk is to diversify across a few investments. A general rule of thumb is that roughly a third of the companies you will invest in will fail and return and return little to no capital, some will make a decent return and some will return 10x or more, making up for the losses on others. What is the tax treatment on investments and gains? For each investment, you will receive a T5013 - Statement of Partnership Income by March 31st of every year. We recommend that you talk to your tax advisor for more information. Does Brightspark co-invest in every investment? Yes, Brightspark’s partners invest their own money in every company, and Brightspark acts as General Partner. What level of post-investment involvement does Brightspark commit to? Brightspark is an active VC investor. Typically, a Brightspark partner sits on the board of directors of portfolio companies, meets regularly with the management team, and works closely with the CEO. What level of involvement is expected from investors? You will not have a direct line to the company - Brightspark usually takes a Board seat and follow the company closely - meeting and speaking on at least a monthly basis. This approach benefits the company, who doesn’t have to manage multiple LPs. Occasionally, the Brightspark team will make connections that they think will be beneficial to the company. You will receive detailed Quarterly reports that include update on the company as well as Brightspark’s insider outlook. What reports can I expect to receive about my investments? Brightspark usually takes a Board seat and follow the company closely - meeting and speaking on at least a monthly basis. We issue quarterly reports to LP investors so they can track the company’s progress. Your reports will be available online. Does Brightspark co-invest with other VCs? Brightspark often shares its investments with top VCs in Canada and the US, and is often part of a larger VC syndicate. This gives our individual accredited investors access to deals that were previously only available to institutional VCs. What happens if the company raises more money? 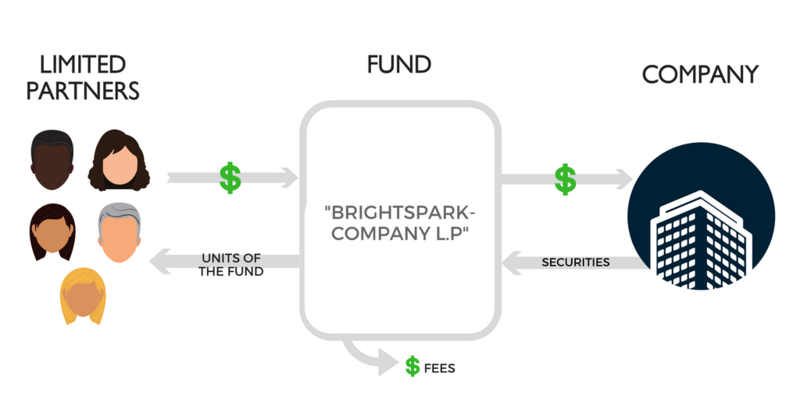 Because Brightspark usually invests at an early-stage, companies will often raise additional funds in their lifetime - these are referred to as follow-on rounds. A new round of funding increases the value of the company. As a Limited Partner in the fund, you will have the opportunity to invest additional capital before any new investor if Brightspark participates in a follow-on round. That’s because when we initially negotiate the terms of the investment, Brightspark ensures that the fund has protective and preemptive protections to allow them to do so. ...investing in a company as an angel investor? You will not own any direct equity in the company. Rather, you will own units in a Limited Partnership Fund. Your investment will benefit from venture capital terms, giving you preferred terms and protective provisions. Your investment is professionally managed by venture capitalists. Brightspark usually take a board seat, and we dedicate our time to ensure that the company–and your investment– grows to its maximum potential. There is no membership fee to join our network, and we never charge the company. We provide professionally crafted quarterly reports to investors. ...investing through an equity crowdfunding platform? Brightspark investments are available to accredited investors only. ...investing in a traditional VC fund? Traditional VC funds are notoriously difficult to access for individual investors - and when they are, the investment minimum is usually very high. Brightspark is accessible to any Canadian accredited investor, and the investment minimum is much lower ($10,000). Returns are also different. When there is an exit event, Brightspark fund investors receive their profits right away. In traditional VC funds, returns are diluted in the larger Fund. Does Brightspark only invest in specific areas or industries? We specialize in software, mobile, and Internet companies with a strong focus on repeat entrepreneurs. We look for portfolio companies with significant upside – meaning market leaders that have the potential to have a 5-20X return on money if they are very successful. And while, our investments tend to cluster around tech, consumer, hardware, and SaaS, that’s not where our curiosity ends. Get in touch if you’re building something different - we still want to hear about you and your vision! At what stage does Brightspark usually invest? We usually invest at the pre-series A stage. Our perfect middle ground is a company that has already delivered a product to market and has some customer feedback. We don’t want to always take a risk in whether the market will like the idea, and at the same time, we prefer not to pay the higher price associated with scale-up financing. Our investments are at a stage where companies have very positive market feedback, and need to finalize a few things: exact pricing, finesse the sales process, determine the exact cost of sales etc. How much money to you typically invest in a new company? Typically, our investments range anywhere between $500k to $1.5m. Does Brightspark invest outside of Canada? What’s the process for companies when raising $? Brightspark’s investment team source deals, conduct due diligence, and negotiate term sheets with entrepreneurs in the same process traditional venture capital funds do. Our network is not involved nor aware of that part of the process. No one in our network is informed that we are looking at an investment opportunity before the term sheet is signed. Once the term sheet is finalized and agreed upon with the company and other co-investors, we open the opportunity to our network. This happens at the same time as the Brightspark investment team finishes the financial, legal, and technical due diligence. While the legal documents are being drafted, investors in our network are given a predetermined timeframe to confirm their participation in the investment. During this process, we collect the funds from investors and close the Limited Partnership prior to closing the single-purpose fund with the company. The shareholder of your company will be “Brightspark MM-YY L.P”. Once the investment is closed, Brightspark will wire the funds to you as per agreed in the term sheet. Will confidential information about my company be shared with Brightspark’s network of investors? This information will be used to notify our network of the investment and can be posted in the notification email, in our newsletter, and on the homepage of our website. This information includes your logo, a short description of the company, as well as the names and pictures of the management team. This information is used to educate our investors on the investment opportunity. It resides on the password-protected area of our website, in private email communication with select investors in our network, and includes the pitch video posted on our private YouTube account. This information is similar to the one used in pitch meetings (your product, market opportunity, competition, strategy, use of funds), and details on the investment (why Brightspark is investing, high-level terms, who the co-investors are in the round). Every piece of information at this level is accompanied by a confidentiality disclaimer. At this level, no detailed financial information or “secret sauce” is shared. Once the round is closed, the details of the investment will be stripped from our website and only high-level, public information will stay published. Information such as financial metrics, competitive data, results of our due diligence process, etc. will not be openly shared with our investor network. In special circumstances, Brightspark investors might request more information about the company to inform their investment decision. On a case-by-case basis and with your permission, we share certain due diligence information with select investors after they have signed an NDA. These documents are hosted on a secure, private network in an application called OneHub. The documents are watermarked, set to “view only” (meaning that no one can download or print the documents), and the ability to take electronic screenshots is disabled. Who are the investors in the network? Our network of investors is comprised of Canadian high-net-worth individuals. Most of these individuals have a background in business or tech, and an interest in investing in early-stage companies. Some are sophisticated startup investors, and most are somewhat new to startup investing. All investors are vetted by Brightspark for accreditation at the time of investment. What is their level of involvement with the companies? In general, individuals in our network are simply driven by a return on their investment, and are not looking to be actively involved in growing the company. We have found that this benefits our portfolio companies, who appreciate having a network of investors they don’t necessarily need to manage. Exceptionally, when we see value and all parties agree, we will connect our investors with our portfolio companies. For example, some of the investors in our network are executives in large CGP companies who can provide guidance and meaningful connections to entrepreneurs selling in that space. You will also have the opportunity to connect with the network and the LPs in your company at exclusive Brightspark events such as our annual AGM and investor meetups. I’m looking for funding for my company. How can I contact you? Simply pre-fund a Brightspark Reserve account, choose an allocation amount for every new company, and sign a single set of documents. Your funds will be held in escrow and automatically applied to new Brightspark investments. Our team curates early-stage investments based on a strict VC due diligence process, and will notify you when we invest in a new company. If you want, you have a 7-day window to review the deal, and you have the right to opt-out or change your investment amount. Every quarter, we will send you a customized report so you can track the progress of your investments. How frequently should I expect to invest with the Reserve? In what kind of companies? We aim to make at least a new investment every two months. All companies are vetted thoroughly through the Brightspark due diligence process. Unlike traditional VC funds, we are under no pressure to deploy capital, and we commit to only invest in what we think are the best early-stage companies in Canada. This means that the investment cadence may vary, depending on the quality of the deal flow we are seeing. Are there any extra costs to the Reserve? There are no extra costs to the Brightspark Reserve. Investors in the Brightspark Reserve are subject to the same management fees (1.5 to 2% per year for the first 3 years, one-time 2.5 to 4% admin reserve fee, 15% carried interest) as the “deal-by-deal” investments. Where will my money be held? Is it safe? Will I collect interest? Your funds are held in an non interest-bearing escrow account. Any interest will be used to cover administrative and escrow account costs. We also take an expense reserve of 4% of each Limited Partner’s contribution to cover the Fund expenses if needed. None of the Expense Reserve shall be paid as compensation to Brightspark. Any monies remaining in the Expense Reserve at the end of the Fund is redistributed to Limited Partners. Examples of expenses covered by the reserve may include legal fees, auditing, insurance, investment banking, tax returns, etc. What does “guaranteed investment room” mean? You can cancel your account at any time. The escrow agent will return any unused funds to you within 10 days. What type of tax documents should I expect for my Reserve investment? For your reserve fund, you will receive a slip for any net interests made. For each investment, you will receive a T5013 - Statement of Partnership Income by March 31 in each year. Who are the people behind Brightspark? Mark Skapinker and Sophie Forest are Brightspark’s managing partners. They are both veterans in Canada’s venture capital industry and have decades of experience in investing and growing early-stage companies. Visit the team page to see the rest of the Brightspark folks and the CEOs we collaborate with. What companies are currently in Brightspark’s portfolio? Visit our portfolio page to see the companies we have invested in. Some of our previous investments, such as Hopper, are still active companies but are part of our previous Fund. What is Brightspark’s involvement with companies post-investment? Brightspark is an active VC investor. Typically, a Brightspark partner sits on the board of directors of portfolio companies, meets regularly with portfolio company’s management team and works closely with the CEO. How will I know when there is a new investment opportunity? You will get notified by email. To make sure you receive our emails, put us on your safe sender list. New opportunities will also appear in the platform. What kind of information will I be able to review before I decide to invest? On our website, you’ll be able to see details on the investment and target company, the market, business model, the management team, FAQs, and often we’ll also post a recorded webinar/pitch. We will also share the Terms of the specific investment online, including details on your investor rights. It’s important to note that all information we share is intended for Brightspark investors only and should not be shared externally. How long will I have to make my decision? Usually, our investments take between 5-20 days from singing the term sheet to being fully subscribed. Sometimes, our investments get oversubscribed and it happens quickly, so we encourage investors to let us know if they want to participate in the investment as soon as possible to secure allocation room. How much do I have to invest in a deal? Our investors can choose to invest as little as $10K per deal. Typically, investments range from $35K to $50K. All deals are in Canadian dollars. What kind of documents will I be able to access in the platform? Can I download/share documents? Easily access your personal documents (subscriber agreement, tax documents), as well as documents related to your investments (quarterly reports, investor updates) any time, from anywhere. We will always notify you when you have a new, unread document so you won’t miss anything! What is the online investment process? What are the steps? Every time a new Brightspark investment opportunity is available, you will be instantly notified by email. You will be able to log in to the platform and review details of the companies - and invest completely online. Tell us in what fund you want to invest in, and how much. Then, review, complete and sign the Subscription agreement. Once approved, you will be notified by email and asked to transfer your funds. When the funds are received, you will receive a confirmation. After the entire investment is finalized, you will be notified that the round is now closed - and you can review the confirmation document online. Note: This process will differ if you are investing through the Brightspark Reserve.